This 429 square kilometer of land is called Koh Chang, or Elephant Island, for a reason. It’s not because of its size, but instead its more to do with the island’s imaginative elephant-like shape. Located in the eastern most province of Thailand, bordering Cambodia, Koh Chang was declared Thailand’s 45th national park. If you are looking for something more lively – check out some of the best hostels on Koh Samui. Along with more than 40 surrounding small islands, it became Mu Koh Chang National Park in 1982. As such, you can expect pristine environment and serenity in Koh Chang, a magic bound to enchant its tourists. So this isn’t your regular touristy island crowded by five-star hotels, resorts and bars but a peaceful mountainous island with pearl-white beaches, coral-riddled water and spectacular waterfalls. Not all the good beaches are in southern Thailand. At Koh Chang, you can choose to sunbathe on the delicate white sand at the famed White Sand Beach, complete with shops, restaurants and a variety of accommodation. Or you can enjoy the less crowded Klong Prao Beach where many luxury beach hotels are situated. Kai Bae Beach is another popular place among travelers since its a safe place to swim, with many inexpensive bungalows situated nearby. Koh Chang was a strategic place during the Indochina War, and it turned into a full battlefield between the French Navy and the Thai Navy. The Songkhla and Chonburi, two battleship wrecks in the sea near Ao Salak Phet, make for an attractive diving site. Those not so adventurous can simply opt to snorkel instead of dive, and the sea around Koh Chang boast abundant marine diversity. After reliving the historical clash between battleships of old, visit the Battle of Koh Chang Monument to get a complete sense of the island’s historical importance. Hire a boat service and visit other small islands within the national park, many of which can compete with Koh Chang for beauty. If you have plenty of time, try a relaxing sailboat and absorb the cool, salty wind amidst the orange sunset sky. The main hubs for boats are the White Sand Beach, Klong Prao Beach, Kai Bae Beachand Bang Bao Beach. The tropical forest of Koh Chang plays host to numerous waterfalls. One of the must-see attractions is the Than Mayom Waterfall, a four-level waterfall that falls almost perpendicularly from a steep, black granite crag. Both King Rama V and King Rama VI of Thailand signed their initials at the top of the cliff. Nearby, the Klong Phlu Waterfall is another beautiful three-level waterfall that is famed for its beauty. One of the easiest mode of transport that lets you go deep into the jungle to enjoy various mesmerizing sight is by way of riding an elephant. The aptly named Elephant’s Island is host to many charming elephants waiting to serve tourists. These adorable animals are friendly and strong, and can easily take you through the most exquisite spots in Koh Chang’s beautiful jungle. 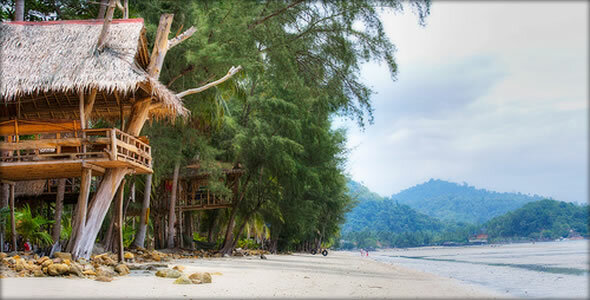 For those preferring the feel of the earth on your feet, Koh Chang is a veritable trekker’s paradise. With its undisturbed forest abundant with wild animals, hiking has never been more interesting, with routes ranging from simple to challenging. The best routes are in the southern half of the island, where you can see animals such as the stump-tailed macaque, silvered langur, and Javan mongoose, amongst many others! Because of its isolation, Koh Chang residents are able to maintain certain lifestyles that are sure to be of interest. You can experience the real fisherman’s life at Bang Bao fishermen’s village, where residents live in houses built on the sea connected to each other by bridges. At Salak Kok village, residents still keep their old way of life.